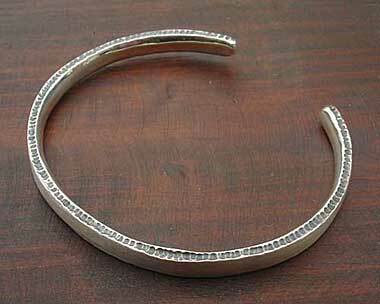 Designer Silver Cuff Bracelet : LOVE2HAVE in the UK! This designer silver cuff bracelet for men or women is a sterling silver torc bracelet that unusually features a textured wall with a slightly oxidised finish. The textured wall almost looks gouged, as it comes created by hand. You can see in the photographs the picked, scooped and chipped shaping all cut by hand. This texture comes in a single row featured on both sides of the bracelet. When worn the texture is quite visible as the indents all catch the light from any angle. The silver surface is plain and comes in a matt finish. 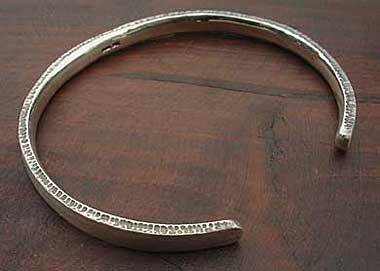 The unusual look of this bracelet has quite an organic quality to it, and its width is approximately 6mm. The internal diameter measures 65mm so fits average wrist sizes of 6 1/2 to 7 1/2 inches. Size(s) Available: 6 1/2 to 7 1/2 inches as standard.